Speaking tour: 10 million French workers on strike May 1968. 10 million workers occupied the factories. Can it happen today? France 1968 - month of revolution. Brutal police repression of student demonstrations. 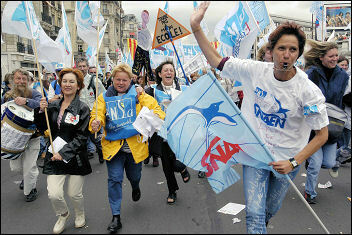 Within days, 10 million French workers are on strike. Victory shows campaigning can save out NHS! Bob Crow, rail union RMT general secretary, announced at a press conference on 29 March that RMT and TSSA London Underground members would take 72 hours of continuous strike action from 6:30pm on Sunday 6 April, writes Greg Maughan. USA elections: Break with the two parties of big business! ON 24 February, Ralph Nader declared he was running for President to challenge the corporate stranglehold over US politics, writes Philip Locker, Socialist Alternative, USA. "Halve your expenses and save our post offices"
SAVE OUR Post Offices (SOPO) campaigners have scored a first-stage victory by forcing Gloucestershire county council (GCC) to consider an 'Essex type' rescue plan for the 27 post offices facing closure in the county, writes Chris Moore, Save Our Post Offices campaign. FSA Northern Rock report: WHEN NORTHERN Rock collapsed last year, the Financial Services Authority (FSA) set up an internal review of its regulation of the bank, writes Kevin Parslow. INDIAN CONGLOMERATE Tata has bought Jaguar & Land Rover from Ford for £1.15 billion - half the price Ford originally paid for the businesses, writes Rob Williams, Convenor, Swansea Visteon Plant. Fight back against the Unison witch-hunt! Four members of Unison who are also Socialist Party members are to face a Unison disciplinary hearing following the distribution of a leaflet at last year's Unison conference, writes Jane James. ...and publication of Marx and Engels’ Communist Manifesto "The proletarians have nothing to lose but their chains. They have a world to win." This ringing battle cry was issued 160 years ago by Karl Marx and Friedrich Engels in their Communist Manifesto. ID cards: No to students being used as guinea pigs! Home Secretary Jacqui Smith recently announced plans for ID cards to be introduced on a 'voluntary' basis for certain groups, including students, writes Steve Sweeney, Cambridge Socialist Students. TWO HUNDRED flights cancelled in three days, 20,000 bags left behind and a three-hour wait to re-claim baggage on arrival, writes Mark Pickersgill. National Union of Journalists conference: The problems being faced by journalists at work and possibly within the National Union of Journalists (NUJ) appear to be intensifying. An NUJ member writes. Saturday 28 June, 11.30-4.30 Speakers include: Bob Crow RMT, Mark Serwotka PCS, Brian Caton POA, plus shop stewards from disputes around the country. Delegates' fee: £5. You could not make it up. Disgraced former Northern Rock chief executive Adam Applegarth will get a payout of £760,000! On Thursday 1 May, Londoners will be voting for the Mayor of London and Greater London Assembly (GLA). London Socialist Party secretary, Paula Mitchell, explains the political ideas on offer. 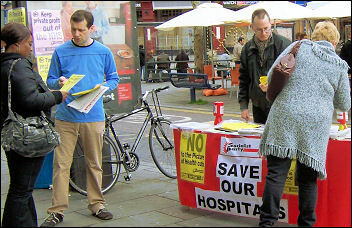 Lewisham/Greenwich: LAST MONTH Socialist Party members in Lewisham and Greenwich went on a demonstration against cutbacks at Queen Mary hospital, Sidcup, writes James Kerr, Lewisham Socialist Party. Exposing daylight robbery in Lincoln! AROUND 50 people attended a meeting in Lincoln where Lincolnshire Police Authority tried to justify the increase in their council tax precept by a massive 78.9%, (see The Socialist 526), writes Marc Glasscoe, Socialist Party Lincoln. NUT strike: No more pay cuts! 24 April strikes: National Union of Teachers (NUT) members across England and Wales will be joining the first national teachers' strike for twenty years on 24 April, writes Martin Powell-Davies, convenor Socialist Party Teachers. 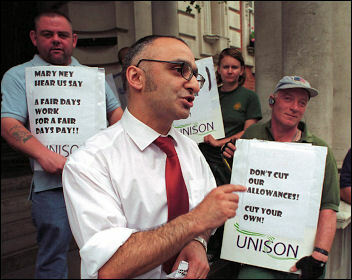 Unison health conference: Reject the pay sell-out! Four members of the trade union, Unison, all members of the Socialist Party, are facing disciplinary charges from their union with disciplinary hearings taking place from 22 to 24 April, writes Jane James. ZIMBABWE'S RULING Zanu-PF party has called for a recount of the votes from the 29 March presidential election - even though the electoral commission has still, after more than one week, to release the figures! Dave Carr writes. Perks for MPs - Bonuses for the bosses - Cutbacks for us! LAST WEEK 'Stormin' Gordon' Brown hit the streets of Coventry, strutting around talking about crime, writes Rob Windsor, Coventry Socialist Party councillor. Journalists met for their union's Annual Delegate Meeting (ADM) as the first national newspaper strike in decades took place in Preston and London, writes Christian Bunke, Manchester NUJ. Rail unions RMT and TSSA have called off their proposed three-day strike on London Underground after winning a number of concessions from management on health and safety issues, writes Reg Johnstone, RMT. CIVIL SERVANTS union PCS general secretary Mark Serwotka has called for trade unionists to pile pressure on the Labour government later this month, writes Rob Rooney. Why should workers pay for the crisis? JCB is the world's third largest manufacturer of earthmovers and other machines for the construction and agriculture industry, writes A JCB worker. Get active and fight back! NUS conference report: Newly elected National Union of Students (NUS) president Wes Streeting, claims students will lose influence on the government if they protest and demand free education, writes Matt Dobson. ON 30 March, Palestinians commemorate Land Day by holding protest rallies and demonstrations all over the world, writes Maavak Sozialisti reporters,. AFTER 11 years as Taoiseach (Prime Minister), Bertie Ahern has announced his resignation for 6 May this year, writes Paul Murphy. Birmingham council have imposed a new pay and grading system onto their 40,000-strong workforce, under the guise of the 'single status' scheme, writes Dave Griffiths, West Midlands Socialist Party. HUNGER AND malnutrition are getting far worse due to rising food prices. Even those fortresses of global capitalism, the World Bank and the International, writes Jon Dale and Jan Rybak. The Human Fertilisation and Embryology Bill: why all the controversy? Striking workers in Greece and Portugal show the wayRepresentatives from European sections of the Committee for a Workers' International recently discussed events in Europe, particularly Greece, Germany and France. Can it happen today? Speaking tour details: Virginie is a member of Gauche Révolutionnaire (CWI France). 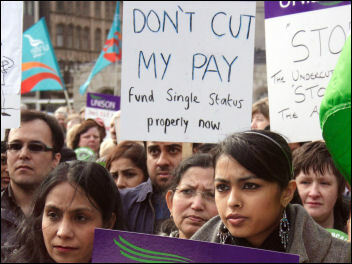 She is a socialist activist and is a trade union representative. or ring 020 8988 8789. On Saturday 12 April, Portsmouth students union, aided by Socialist Students members, held its inaugural Activist Academy, which brought together around 30 campaigners during the course of the day from groups across the south. Will Schafer-Peek, Southampton Socialist Students reports. THIS YEAR marks the 40th anniversary of the assassination of Martin Luther King, who was assassinated on 4 April 1968 while supporting striking Memphis sanitation workers. Will Soto, from Socialist Alternative in the USA, writes. Greenwich Unison branch secretary Onay Kasab is one of four Unison officers currently facing a disciplinary hearing as part of a witch hunt being carried out by the union bureaucracy, writes Susan Wilson. South Camden Community School, Charrington Street, London (near Kings Cross/Euston stations), writes Speakers include: Bob Crow RMT, Mark Serwotka PCS, Brian Caton POA, plus shop stewards from disputes around the country.. The elections for the National Executive Committee (NEC) of the Public and Commercial Services (PCS) union have just started, writes Katrine Williams, PCS Wales chair, personal capacity. SOCIALIST ALTERNATIVE election canvassers are being well received on the doorsteps in Wythenshawe in Manchester, writes Lynn Worthington, Socialist Alternative candidate for Baguley ward, Manchester. Huddersfield: THE SOCIALIST Party in Huddersfield is now deep into its third straight year of election campaigning, writes A Huddersfield Socialist Party member. AS THE US economy moves sharply downwards, the threat of a crash in the British housing market is becoming ever more real, writes Marc Glasscoe, Socialist Party Lincoln. GORDON BROWN and New Labour are carrying out daylight robbery against the lowest paid workers, writes Tom Penman, CWU member and call centre worker, Dundee. On 24 April almost half a million public-sector workers will strike a blow against the government's policy of public-sector pay restraint, writes Jane Aitchison, civil service union PCS, Department for Work and Pensions group president, personal capacity. WITH SOUTH Africa's ANC (African National Congress) government split over its attitude towards the Mugabe regime in neighbouring Zimbabwe, South African trade unionists used their strength decisively to act against the regim, writes Keith Dickinson. 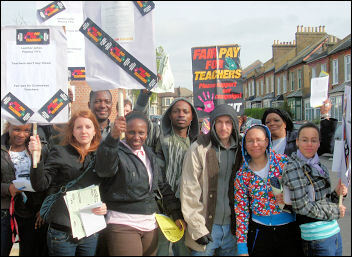 TEACHERS ACROSS England and Wales are out on the streets on 24 April, many on strike for the first time in their lives, writes Linda Taaffe, Waltham Forest NUT. "Socialist councillors are the only ones who've ever stood up for this area and taken the time to listen to us, I'll definitely be voting for Dave" - this was typical of the responses received by Socialist Party supporter, writes Richard Groves, Coventry West Socialist Party. SHELTER MANAGEMENT'S recent derisory offer to its workforce has got the answer it deserved. A Shelter worker writes. I'M ON strike on 24 April with hundreds of thousands of other workers across the public sector, writes By a DWP worker. Grangemouth refinery: FUEL STRIKE 'will bleed pumps dry' and 'Panic at the pumps,' were some of the sensation-seeking headlines in Scotland's newspapers on 20 April, writes Philip Stott, Dundee. Seroxat scandal: IN MAY 2003, Britain's biggest drug company Glaxo-SmithKline (GSK) handed a document to the Medicines and Healthcare Products Regulatory Agency (MHRA), writes Alan Manley, nurse and Unison member Dundee. GARY MATTHEWS, who was a Jersey Left Green MP from 1993-96, spoke to Jon Dale. Now living in Derbyshire, Gary is still active in the Time for Change group on Jersey, which has a founding conference on 27 April. How can we defeat the far right? The far-right, racist British National Party (BNP) is hoping to gain a seat on the Greater London Assembly on 1 May, as well as more councillors round the country. The Socialist outlines Socialist answers to the far-right. Usdaw conference: HOW DO we recruit migrant workers into the trade unions? Their recruitment is a major challenge facing the unions today. An Usdaw member writes. A victory for the right led by Silvio Berlusconi and an electoral 'bloodbath' for the Sinistra arcobaleno (Rainbow Left). Christine Thomas, Lotta, cwi Italy, writes. The rich get richer... and we foot the bill! At 6am on 27 April the night shift at Grangemouth oil refinery walked out on strike, writes Ian Leech. At the Child Support Agency site in Hastings, managers have given staff member Frank Swaine (aka Swayne) permission to stand for the BNP in the local elections, writes A CSA worker. With bills rising, council tax hikes and petrol going through the roof it's little wonder that council workers in Lincoln feel as if they are getting poorer, writes Marc Glasscoe, branch secretary, Lincoln City Unison, personal capacity. BOLIVIA IS awash with rumours about an impending right-wing coup against the elected government of president Evo Morales, writes Karl Debbaut. Tales from the council chambers: PROTESTS CAN change things - but are even more effective when there are socialist councillors to direct public pressure onto the establishment parties, writes Clive Heemskerk. "Why I am standing against Labour"
Manchester University: At 4pm on Tuesday 22 April, around 300 University of Manchester students gathered for a campus demonstration to express their anger at the way the university is run, writes Abby Taylor, Manchester University Socialist Students. THE NATIONAL Health Service has its 60th birthday this July. Can working people still celebrate this vital service which they struggled for years to obtain, writes Keith White. 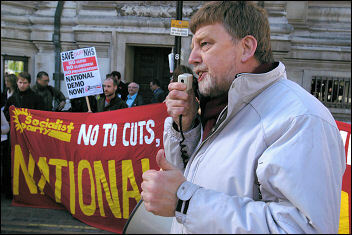 Public sector strike shows fightback has begun! Last week hundreds of thousands of teachers, civil servants and college lecturers struck a blow for everyone who has had their living standards attacked in recent years, writes Steve Score, Leicester Socialist Party.